You could have these Roasted Sweet Potatoes and Red Onions with Feta for Thanksgiving, but I’d happily eat this for a Meatless Monday main dish. Use the Diet-Type Index to find more recipes like this one. Click here to PIN these Roasted Sweet Potatoes and Red Onions with Feta! I realize these Roasted Sweet Potatoes with Red Onion and Feta may be a tough sell with some people who love sugary sweet potato casserole, but I loved them and so did my nephew/cooking assistant Jake who never used to like sweet potatoes at all. I’ve been trying out savory sweet potato recipes for a few years now, and somewhere along the way Jake realized he *does* like sweet potatoes when they aren’t topped with brown sugar/and or mini-marshmallows. 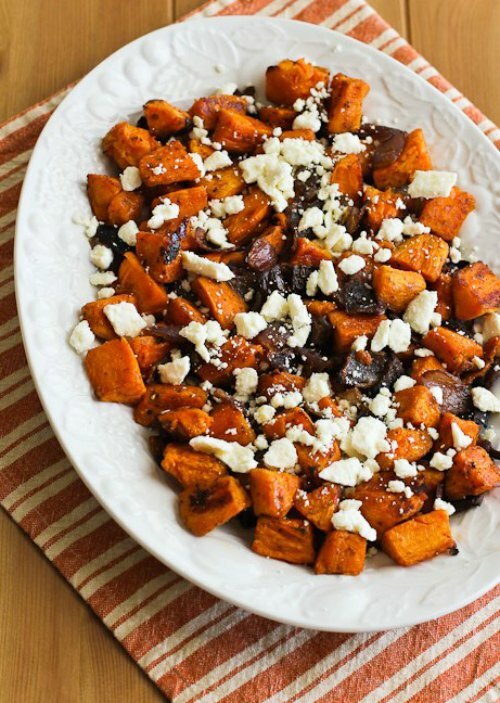 I also think that roasting the sweet potatoes is a wonderful trick to bring out their natural sweetness, and combining them with something salty like Feta cheese gives that wonderful salty-sweet combination that is so appealing. I’m adding this to the Thanksgiving Recipes on the blog, but quite seriously, I’d also be very happy with a big dish of this for a Meatless Monday dinner as well. Cut up two large sweet potatoes into pieces that are about 1 inch square. Cut the red onions into pieces that are the same size (or next time I might make them slightly bigger than the sweet potaotes.) Toss sweet potatoes and onions with 2 tablespoons of olive oil and 1 tablespoon of my seasoning for Spicy Sweet Potato Fries. Spread the sweet potatoes and onions out on a baking sheet that you’ve sprayed with non-stick spray or misted with olive oil. (Blogger FAIL, I cooked these about 10 minutes before I realized I hadn’t taken a photo.) If they seem crowded at all, use two baking sheets. Flip them over a few times while they’re cooking; this is how mine looked after about 25 minutes roasting time; this was the second time I turned them. I roasted mine about 40 minutes total, but depending on your oven and how big the pieces are, you might need a few minutes more. Season with salt and fresh ground black pepper, sprinkle with Feta, and serve hot. These Roasted Sweet Potatoes and Red Onions with Feta would be a great addition for Thanksgiving, but I’d happily eat this for a Meatless Monday main dish. Peel sweet potatoes and cut into cubes about 1 inch square. Peel red onions and cut into pieces slightly over 1 inch square. Sprinkle 1 tablespoon seasoning for Spicy Sweet Potato Fries over the veggie mixture and toss until all the vegetables are coated with the seasoning mix. Spray a large baking sheet with non-stick spray or mist with olive oil. Roast about 15 minutes, then flip them over with a turner, roast 15 minutes more, then flip them over again. Total roasting time will be 40-50 minutes, depending on the size of the sweet potatoes, your pan, and the oven. Season with salt and fresh-ground black pepper as desired, sprinkle with crumbled Feta, and serve hot! Sweet potatoes are a great carb-conscious choice for Phase 2 or 3 of the South Beach Diet, but if you’re actively trying to lose weight on Phase 2, I would eat Roasted Sweet Potatoes and Red Onions with Feta as a side dish with lower carb choices for the rest of the meal. This is good for low-glycemic diets, but too high in carbs for low-carb eating plans. Pingback: 25 Root Vegetable Recipes! Awesome For Fall! Joanne, we loved it here, so glad you enjoyed it too. really delicious! Thanks for a new recipe to add to my collection. Looks great; can't wait to try it… Peeling the sweet potatoes as soon as I'm off the computer! Thanks Becky, my favorite flavors too! I'm so into sweet potatoes and love what you've added to them NOw I'm craving these flavors! Thanks Lydia. I thought the three flavors here made a wonderful combination; loved it! What a great idea to combine the potatoes with salty feta. I'm not a fan of super-sweet sweet potato dishes, either, so this one's going on my list to try. Hari, glad you like it. Joanne, not a fan of marshmallows in any form, but I especially dislike them on sweet potatoes! I'd definitely choose this over the weirdo marshmallow topping. 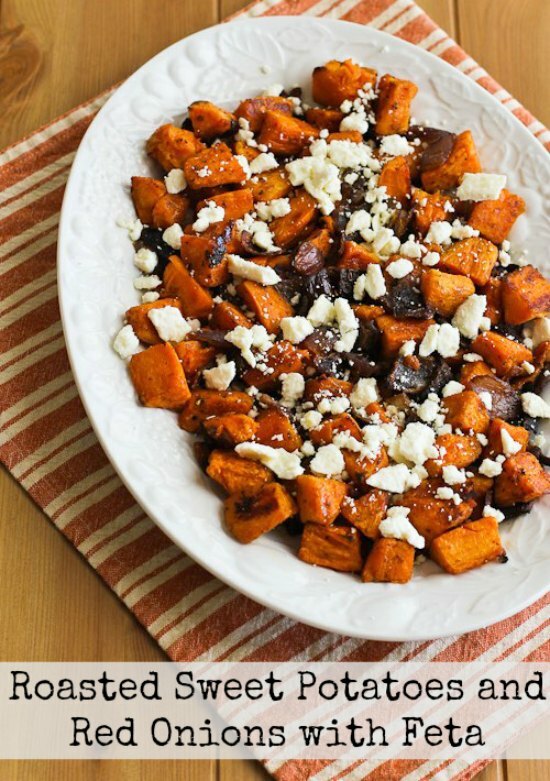 Feta and sweet potatoes are perfect for each other! Jean, I agree that pecans and sweet potatoes are a great combination! Lynne, the sweet potatoes with brown sugar and marshmallows are just one way to cook them here, but many people like them that way. Different cooking cultures, I think. Love these – also delicious with toasted pecans. Pam, it was really good! Thanks Nick; definitely a big hit here! Looks awesome, can't wait to try!